There’s no doubt in my mind that chef Sam Mason is a genius. 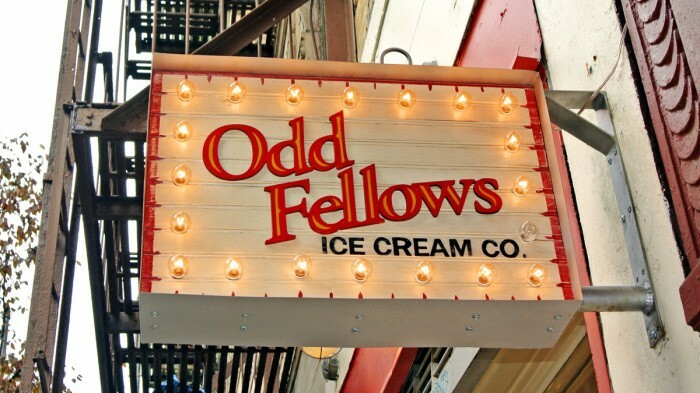 He in fact runs his ice cream shop OddFellows sort of like a mad scientist would run a lab – inventing crazy concoctions that truly nobody has ever thought to do before. 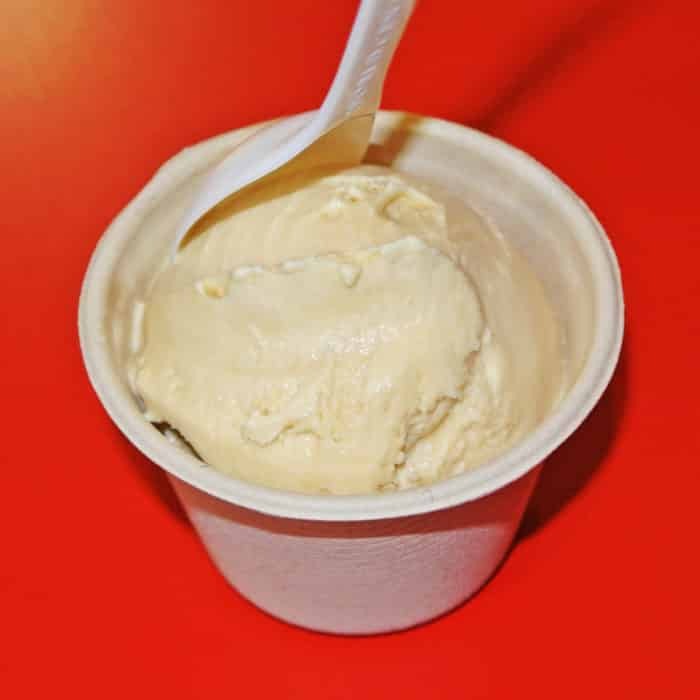 Take, for instance, his famed Chorizo Caramel Swirl Ice Cream – that’s a flat-out bonkers idea to do to ice cream. I can admit that I was a little disappointed to find that it wasn’t available during my visit (not that I wasn’t able to find other amazing insanities to try). 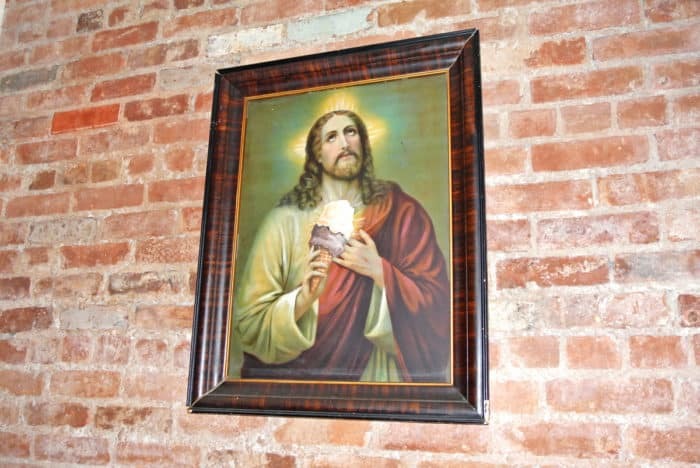 Actually, this new East Village location of this Brooklyn-based ice cream shop looks pretty darned zany – like a perverse carnival gone wrong. 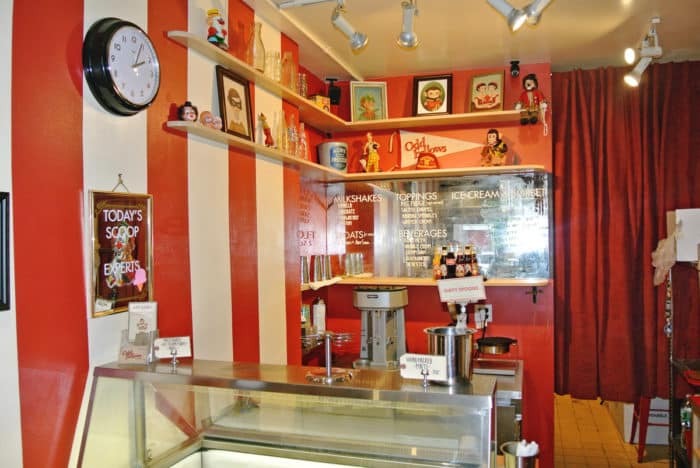 With its bold red stripes and excess of wacky clown-like imagery, you’ll know you’re in for something unusual the moment you step foot inside. 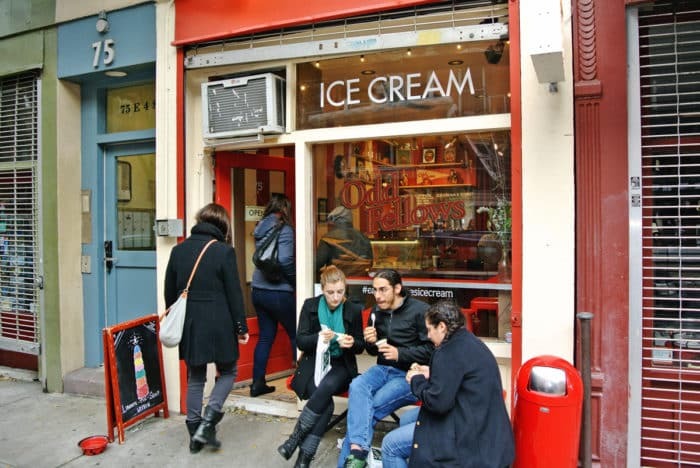 Really, this is the kind of place you just have to go taste for yourself to truly understand because photos of ice cream is never going to do Sam’s complex and inventive flavors justice. 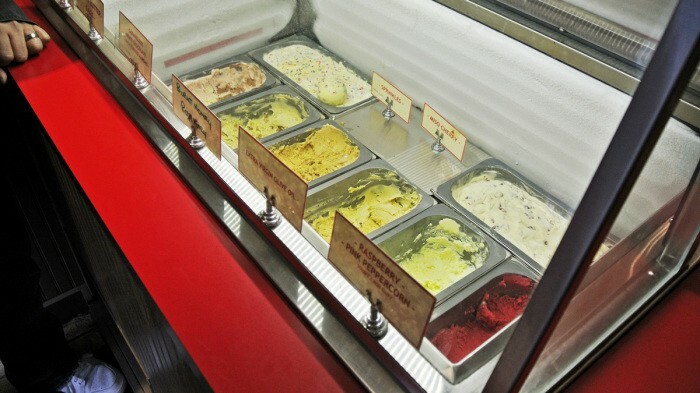 The offered flavors are constantly changing, but when I visited, the ice creams we could choose between were Neapolitan, Miso Cherry, Burnt Honey Rosemary, Brown Butter Sage, Sprinkles, Extra Virgin Olive Oil, Caramelized White Chocolate with Toasted Almonds, and a Raspberry Pink Peppercorn Sorbet. Ultimately, after sampling a variety of the options, I let Amy do the picking and we landed on Burnt Honey Rosemary. Amy absolutely loves rosemary flavor so it was no surprise to me that this is what we ended up eating. Both the honey and the rosemary flavors were so extremely bold and wonderfully in-your-face. You guys probably know by now that I absolutely love when food is aggressive to the point of being challenging to consume. And that’s exactly what this was, but it was also downright delicious. If I were to give a shoutout to one additional flavor that I sampled, it would have to be the Miso Cherry which – I know – sounds truly bizarre. Yes, the miso flavor was REALLY STRONG, but somehow the funky saltiness worked really well when paired with the bright, cherry sweetness. Sam Mason, you’ve really outdone yourself with this place. These creations truly are incredible. I can’t wait for my next visit to experience more of your madness and brilliance. 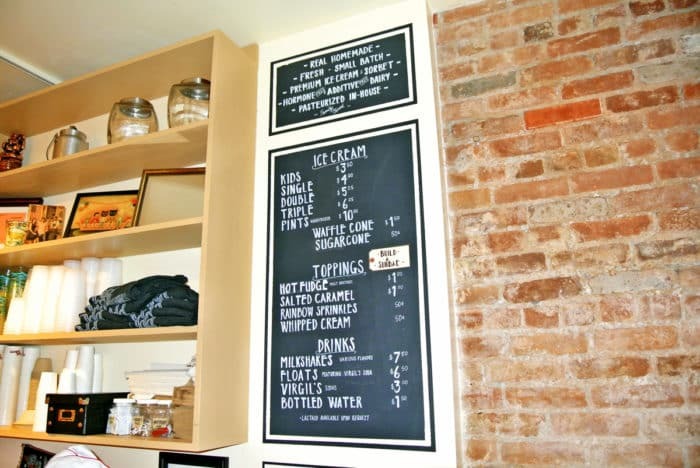 Got another place to get unique sweets in NY that I should check out? Let me know in the comments below.